Here's a quick shot of the figure that was given as a gift-with-purchase at Comic-Con at the Diamond Select Toys booth. It's basically a redeco of the existing Gator, but with an axe rather than a sword. We'll have more on it shortly. It is also worth noting that from my conversation with Diamond, this may well be the final entry in the line. So we got two figures. 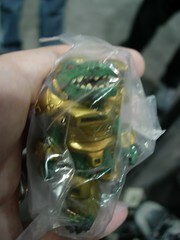 There were other Battle Beasts products shown, however.